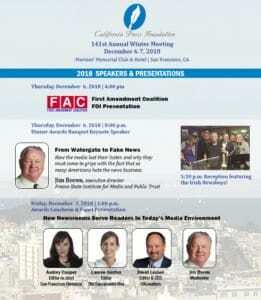 Registration closes this Friday, Nov. 30 for the California Press Foundation’s 141st Annual Winter Meeting, to be held next Thursday and Friday, Dec. 6-7 at the Marines’ Memorial Club & Hotel in San Francisco. One more thing: It’s #GivingTuesday. Perhaps a donation for Cal Press?